Gorgeous, Shannon! I love this tulip image and you colored them so beautifully! The papers, colors, and ribbon enhance the beauty of the tulips! What a perfect Mother's Day card! Have a fabulous weekend! This is such a pretty card, Shannon. 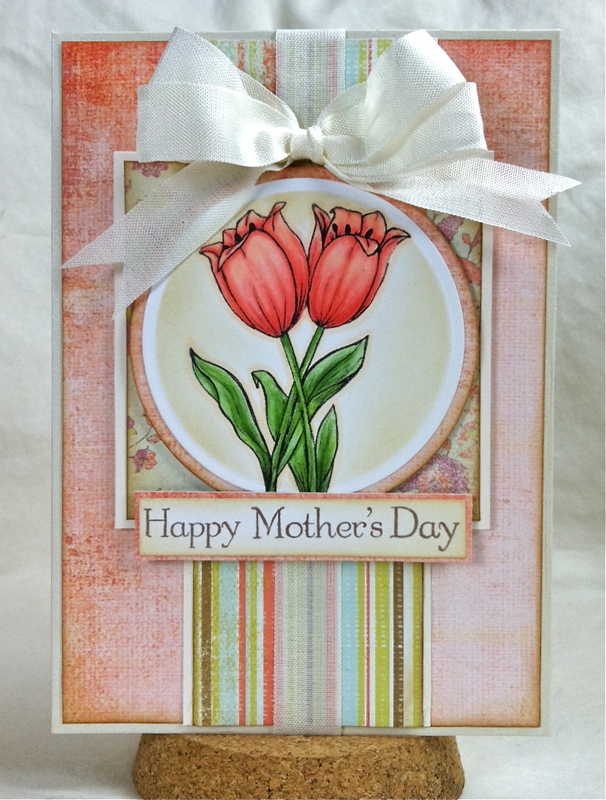 Your tulips have been beautifully coloured and I love your choice of backing papers...gorgeous! This is gorgeous Shannon! I love the image and those delish papers are just perfect with it. The beautiful ribbon and bow finishes it off perfectly! it's a really sweet card! Another beauty - and colored to perfection! What a pretty Mother's day card with those tulips! I love the papers and colors and especially the sketch you used! NJ! What a beautiful card. Amazing coloring on the tulips. Great selection of papers as well. Fabulous!! What a gorgeous Mother's Day card! Lovely flower image colored perfectly! In very pretty colors, too! Your card is beautiful, love the tulips, your coloring is just amazing. Have a great weekend. A beautiful Mother's Day card, love the image, your colouring is fab! Your creation is truly a work of art!!!!! Another stunning card Shannon! I love that image and your coloring is beautiful!! This is so beautiful Shannon!! You have colored the tulips perfectly, it reminds me of a watercolor painting. This is GORGEOUS! SUch beautiful coloring and design! Hope you had a WONDERFUL week!